The final challenge – out and back again. 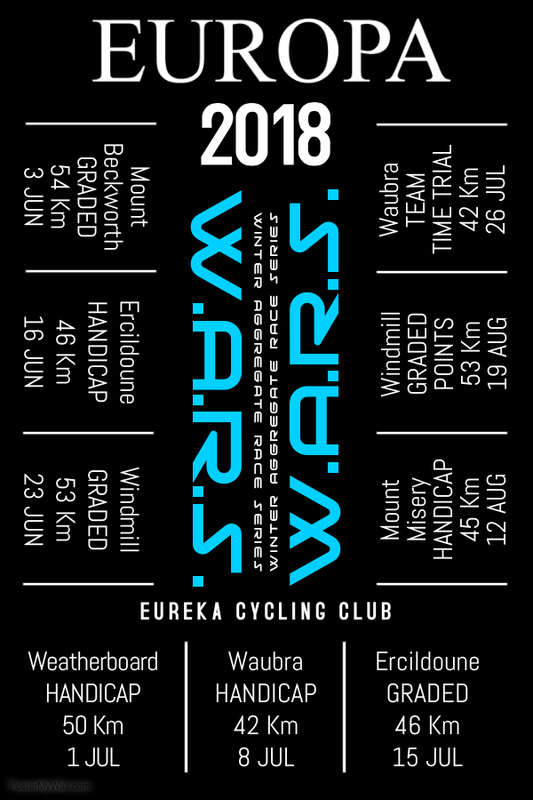 Nineteen riders assembled for the final round of the EUROPA Cafe 2018 Winter Aggregate Race Series – the Team Time Trial. Foggy pre-race conditions gave way to brilliant sunshine before the event started. scratched onto a sheet of rusty corrugated iron, the rules are hidden from would be raiders and only dragged out on race day. 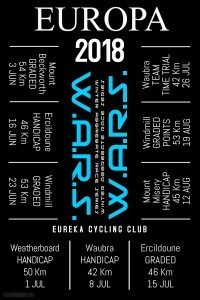 All anyone needs to know is that entries are split into teams of riders with similar ability. Each team is allocated a “secret” handicap mark. Teams are released from the starting gate at intervals in the race of carrots – where you either are chasing a carrot, or you are the carrot. The game plan is simple – ride hard! Calculations are made after each team has crossed the finish line and the winners are announced. The first team away was the trio of Jacqui Dawson, Terry Collie and John Faulkner. Dawson has been in terrific form in her first race season – however this was her first TTT. Collie has been gradually building fitness – post winter holidays – as he aims at the spring Opens. Road Captain Faulkner was back for his first race in months – he had been tapering all winter for this event. Out on the road, Dawson quickly assumed pacing responsibility. The head wind on the way out to the turnaround was strength sapping and the long climb back up Mount Misery all but sealed the team’s fate. The next team on the road included Dan Whelan, Roger McMillan, Phil McLennan and Road Captain James Gretton. Whelan is usually Road Captain due to not hearing instructions from anyone else, however no one could hear him talk today – either acute laryngitis or his beard was too thick to allow sound out. Gretton is still not completely on top of his game – so having Whelan along as a work horse was ideal – the short course would suit his form line. It is always difficult to tell how McMillan is going form wise – it is up and down like a yo-yo at the best of times. McLennan was out to learn some more race craft from his experienced team mates. Their race panned out as expected. Whelan doing a lot on the front into the wind even though he is still crook. McMillan and McLennan working hard to rotate and rest up the big engines. Gretton “owning” the downhill sections. All four crossing the line as a team! Almost the entire winning Team from 2017 were reunited to attempt back to back victories. Jeremy Humber, Mark O’Callaghan and Road Captain Peter Livitsanis were joined by new recruit – Rick Calvert. Humber already had the 2018 W.A.R.S. title secured, so today was more about team mates than self. Livitsanis was still a chance of finishing on the W.A.R.S. podium. O’Callaghan has had a horrid winter, so fast miles in the legs suited his program. Calvert is stripping fitter and stronger than ever before – he came in to replace Whelan, who was dumped. The virtual meat in the sandwich, Team Humber’s plan was to limit their losses to the faster teams. Calvert provided a big engine for the team to follow, the others doing their bit and making sure everyone stayed together. 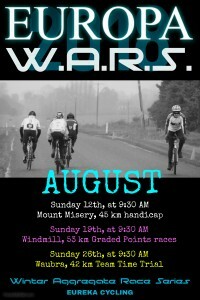 Matt Bowman, Rob Phillips, Jason Hendry and Road Captain Dean Wells were the second to last team away. Bowman heard there was a Time Trial on and fronted up for his first race in quite a while. Phillips is still on the comeback trail from his winter break. Hendry was out for his first ever TTT. Wells had created a foolproof plan to win the day – fast at the start, fast in the middle, fast at the end. Out on the road and Wells soon realised that he hadn’t actually told the other team members what his plan was. Bowman was strong. Phillips provided great relief. Hendry is getting stronger each race. Tim Canny, Jason Birch, Tavis Baker and Road Captain Craig Lee created a most formidable team. Canny was back for his first race in a few weeks. Baker was having his last hit out before flying to Varese, Italy for the UCI Gran Fondo World Championships. Lee was drooling with excitement over racing a time trial. Birch, less so. From the gate the pecking order was quickly established. Canny and Lee setting the pace, Birch and Baker providing support whilst keeping the other two tamed. With teams starting at three minute intervals, the field spread was just five kilometres by the time TEAM Shark set off. TEAM Bacchus Marsh saw a steady procession of teams pass them inside the first 17 kilometres of the race. TEAM Fidel held the lead for a short while before TEAM Jet swept to the front at the 20 Km mark. Through the turnaround and everyone got to see just how close TEAM Shark was. TEAM Riff Raff had reached the front of the race with 19 kilometres remaining. The long drag up Mount Misery was aided by a light tailwind. TEAM Shark caught TEAM Jet with 15 kilometres remaining. TEAM Riff Raff were still at the head of the race – but road position means nothing in this event! Figuring they only had a 3 minute advantage, they were striving to lead the field home. TEAM Shark edged closer and closer (cue Jaws music…). Through Addington and the climb back up Edmonston Road finally saw the catch. Onto the home straight and TEAM Shark tried to stretch their lead beyond half a minute. A final effort from TEAM Riff Raff saw the gap close to just 14 seconds on the line. TEAM Jet came through just over two minutes later. A longer wait for the remaining teams. Back at the club rooms the all important calculations were made. The end result was quite tight with TEAM Jet winning the day by just four seconds, further cementing Humber’s place at the top of the W.A.R.S. points table. The result also saw Livitsanis hold onto second place, with Lee jumping into third.